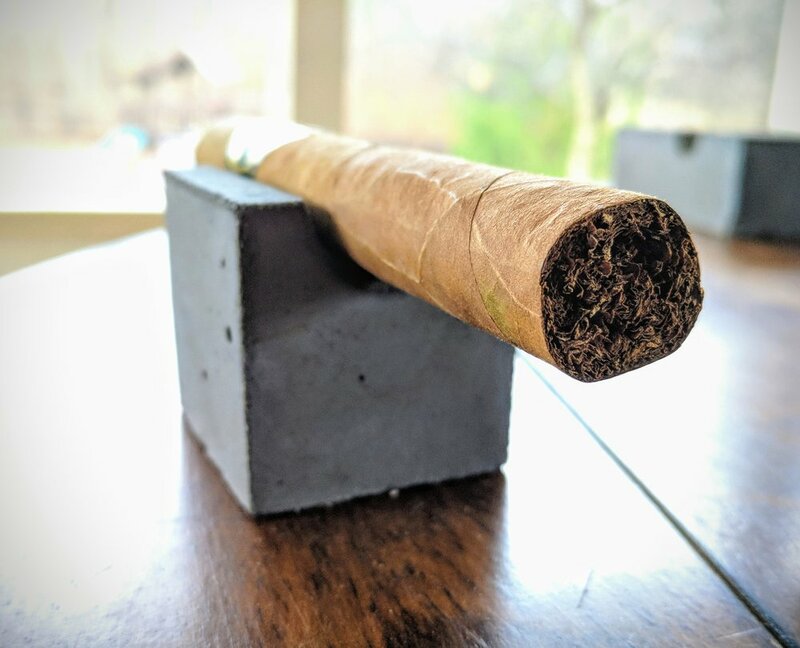 This will hopefully be part of an on-going series of reviews highlighting house brand, factory seconds, etc with a goal of discovering great values and, conversely, which cigars you can probably steer clear of. The Famous Nicaraguan line is sold through Famous Smoke and billed as "One of our most satisfying best buys!" It seems that this is not a segundo but rather just a value house brand offered by Famous. 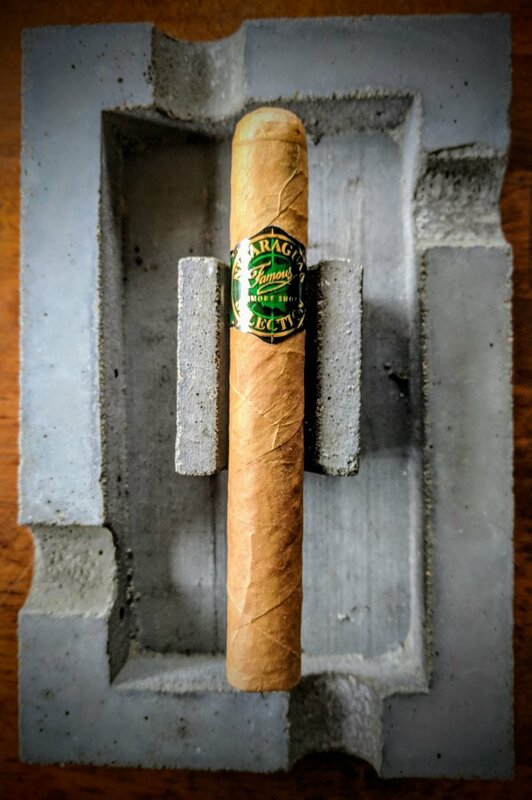 Outside of the basic specs, there is very little info about this cigar or how/where it's produced. The band that adorns the Nicaraguan 2000 is utterly boring - but then again, that's kinda the point. The whole goal is to spend as little money as possible on marketing, boxes, etc to make the cigars themselves as affordable as possible. That said, I think they could have easily gone for a simpler green band, even just fabric and achieved a classier, more appealing look. It's easy to see how the Ecuadorian wrapper on Famous' Nicaraguan 2000 toro is value-centric. Aesthetically, it's definitely low-grade. There are several small, irregularly shaped holes and the coloration is a little uneven. Some portions of the wrapper are a caramel, tan color while others are lighter. There are also some green water marks near the foot. Small, raised veins dance across the body of the cigar. The wrapper is not very oily and has only a light sheen to it. The cigar has a nice firmness to it. It lightly compresses when squeezed however there are a couple softer spots - near the midpoint and towards the cap. For a value cigar, the cap is very nicely applied. It looks like a double cap and the roller did a fantastic job blending it well into the body of the cigar. The foot looks pretty good except for a couple gaps - one bigger and one fairly small. Definite hay on the nose going hand in hand with a little bit of barnyard. The cold draw is a bit snug and brings out some citrus sweetness and hay flavors. The Famous Nicaragua 2000 starts out very mild and enjoyable. Flavors have a pleasant creamy vanilla and citrus quality to them. No harshness to be found. The draw is far from perfect but its good enough for now. I hope a little burn time will help to loosen things up. The cigar lit up remarkably well - evenly and with a great burn line. Again, for a value cigar, impressive. Smoke production is prominent. It's not obnoxious but a constant stream of pleasant smelling smoke is always present. This mild cigar doesn't disappoint for flavor. There is a really nice, subtle creaminess and citrus that is complimented by just a bit of vanilla. Really great so far. The draw is starting to loosen a bit and hitting a nice resistance. The burn really is great. The burn line wavers slightly but is basically consistent all the way around. There is an excellent density to the ash - so far it's hanging on at about the inch mark. The ash is stacking well with a faint tan color with dark gray striations. At about the mid-point, the sweetness of the first third is quietly being replaced by an oak flavor that is still mellowed by a nice creaminess and just a hint of walnut. The retrohale is mild and interesting - helping to draw out the walnut more dramatically and also brings in a little orange zest. The draw has opened up very nicely and it's smoking perfectly. There are no changes in the burn characteristics at this point - and that's a good thing. It's burning evenly and at a great pace. The ash held on to about an inch and a half before dropping. It had stacked very well and seems to be starting down the same path again. The final third of Famous' Nicaragua 2000 progresses further away from the sweet creaminess with which it started. The smoky oak is still present and a toasted bread or cracker taste is at the forefront now. The flavor profile has shifted completely to the savory side. There is also a subtle brine lingering on the finish as well. 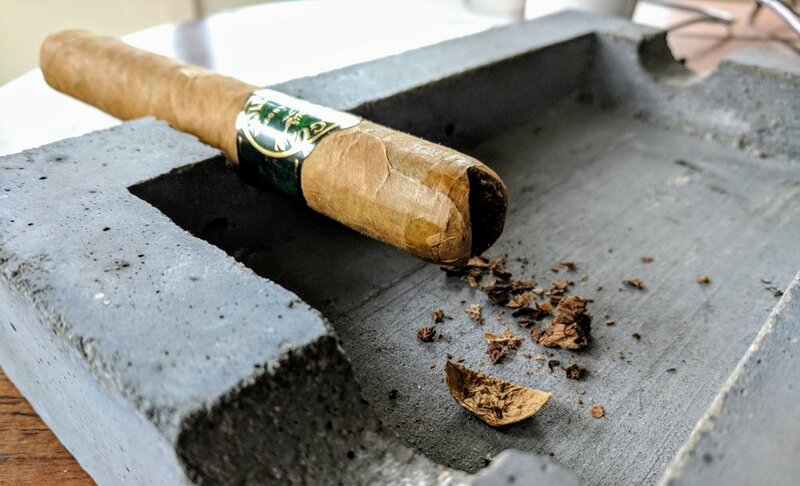 The initial puffs of this cigar had me concerned about the draw but as it burned down, the draw really loosened to be exactly what you'd want in a cigar - a moderate resistance exactly like that of a milkshake. Famous' Nicaragua 2000 really had all the characteristics you'd hope for in a flavor profile. The flavors weren't earth shatteringly amazing but the were carefully balanced and displayed a great progression from the soft cream and zest at the onset moving to a savory, toastiness at the end. 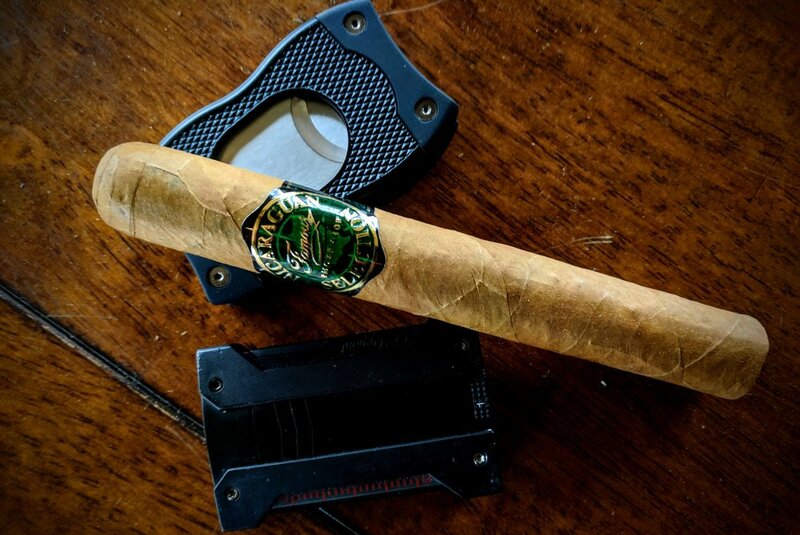 The cigar's burn characteristics were never an issue and certainly an afterthought when assembling this review. The burn line was not razor sharp but it was consistently even and I never needed to click my lighter for any manner of correction. A well-made cigar that burned flawlessly. I must admit that I had low expectations for the Famous Nicaragua 2000. House brand cigars for the conglomerate internet cigar sites typically are a bit lackluster in my opinion. Famous' Nicaraguan blend omits any sort of fanciful branding and marketing and sticks to what a cigar at this price point should be - a great $2 smoke. The flavors are well-balanced and approachable to novice and seasoned smokers alike. 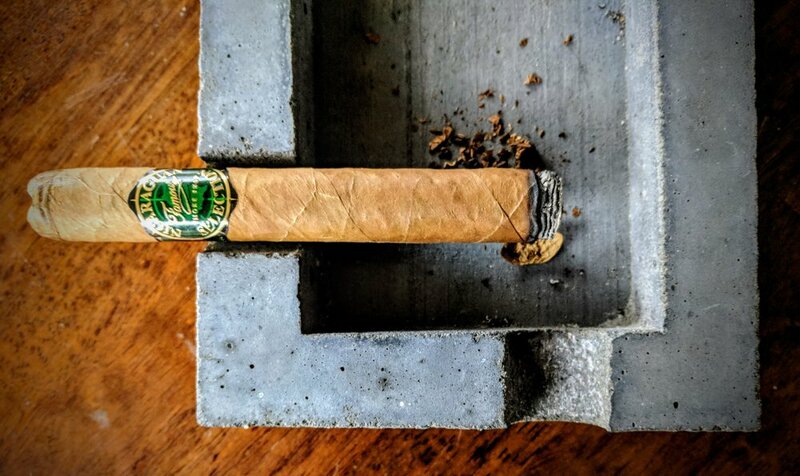 The construction, while not the prettiest, is good enough to provide an enjoyable, easy smoked experience. At an MSRP of $40 for a bundle, if you're looking for a stick to stock your humidor this feels like a solid choice.